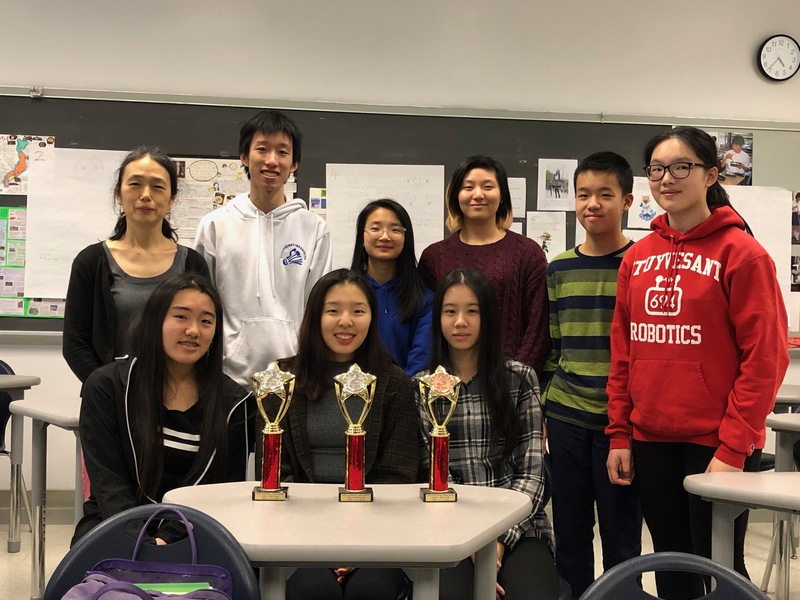 Chie Helinski has been teaching Japanese at Stuyvesant since 2000; in addition she has been a faculty adviser of Japan Bowl, National Honor Society, anime club, Go club, Kendo club, Inspiration (literary and art publication), and Robocup club. Ms. Helinski has also served as the coordinator for the New York City public school Japanese teachers and was a committee member when the New York Japan Bowl regional competition started in 2001. Ms. Helinski received the New York Times “The Teachers Who Make a Difference Award” in 2004. Do you recall your first day at Stuyvesant and your impressions of the school? I had to take over from a hugely popular and charismatic teacher, Mr. Lugo, who started the Japanese program at Stuyvesant, so I was naturally nervous. The freshmen and I arrived at Stuyvesant together, so there was a natural bond as new kids on the block. The returning students were different. I remember introducing myself in Japanese. I don’t know if it was because of that, but a few students dropped the class and never returned. Overall though the students were very bright and motivated. It was an honor to be there. How did you wind up teaching at Stuyvesant? I was teaching in another high school in New York City. I knew Mr. Lugo, and when he decided to retire, he called me and asked if I would take over his program. I had to do a demo lesson before I was given the job. I guess my being Japanese wasn’t good enough. LOL. I’m sure it was because I had never taught in an academically gifted and challenging school, so they wanted to make sure if I could teach. Are there any other NYC public high schools, specialized or not, that offer Japanese classes? Bronx Science, Townsend Harris, Frederick Douglass Academy, Francis Lewis, East West, Forest Hills, Bayside, and one or two more offer Japanese. When I started, the program had only 3 levels. But we soon added the level 4 class. That is now a AP Japanese class. I am the only Japanese teacher at Stuyvesant, so I teach all 4 levels. What’s your favorite memory as a teacher? What’s your favorite thing about teaching? There are so many. What makes my job unique is that I stay with the same students for up to four years. So I get to watch my students grow over the years. That’s the most exciting part of my job. One time, during a tutoring session, a student asked me how to say sushi in Japanese. The conversation that ensued was like a stand up comedy act. When he finally realized that sushi was a Japanese word, everyone there laughed. From that time on, we called him sushi. I watched him struggle, keep going, and blossom beautifully. He went on to a very good college and is doing very well. Recently, he emailed me and shared with me how he fared in Japan using the Japanese he learned at Stuyvesant. Please tell us a bit about Japan Bowl, and the contests your students enter. We used to participate in the National Japan Bowl years ago. Our first Japan Bowl was a humbling experience. The textbooks we had were rather old-fashioned. The Level 2 team made it to the final round. There was a question that involved a carrot. The textbook didn’t have any vegetables in it, so I knew my students couldn’t answer. But the team captain was gutsy and rang in and said “kyarotto.” Of course it was ruled incorrect. I knew I had to get different textbooks. Anyway, our students did very well after that. One year, we swept and won all three levels. And there was one team that won their every Japan Bowl competition. At the same time, I wanted to be more inclusive. Japan Bowl team consists of only three students. So I ended our glorious Japan Bowl career and started an all-day cultural event called Japandemonium. Everyone in the Japanese program is invited and spends a whole day in the cafeteria. Last year, I brought three teams to the National Japan Bowl. We had no idea what to expect, but they all advanced to the final round and took the 2nd place (Levels 2 and 3) and 3rd place (Level 4). The students enter a haiku contest every year. It’s hosted by the Northeast Council of Teachers of Japanese. They’ve gotten great results, often winning 1st place in the Japanese haiku division. NECTJ also has an annual speech contest. Our students do well in it. One year, a student won the regional and the national speech contest and went to the international contest in Japan. She received a mayoral award. The American Association of Teachers of Japanese hosts a New Year’s greeting card (nengajo) contest. Stuyvesant students are talented in many ways. Some are great artists. I submit some of their cards to the contest. The students also take the National Japanese Exam given by the AATJ. Is Japanese an especially challenging language to learn, and if so, why? Japanese has no cognates, and my students come to me illiterate, so to say. We have three separate writing systems (kanji, hiragana, and katakana), and the word order is totally different from English. I tell my students to speak Japanese the way Yoda speaks English. Then it will come out all right. I know it’s not the easiest language, but if you study 30 minutes every day including a holiday, it shouldn’t be a difficult language to learn. Do any of your students take two languages at Stuyvesant? Students used to take multiple languages, but nowadays, they don’t seem to have either space in their program, or they prioritize math and especially science and don’t. But I have two seniors (one in Level 1 and one in Level 3) who take Spanish and Japanese this year. In the past, Spanish was the main language and Japanese was added as an elective. What reasons do students give for taking your classes? Anime, games, J pop, and J drama. Some say they liked the sound of Japanese, and some say they were interested in the culture and food. But mostly, it’s the pop culture that attract the students to learning Japanese. Do you keep in touch with any of your former students? Yes. I get birthday wishes and new year’s greetings every year. They come back to Stuyvesant to visit, some on the alumni visiting days and others when they want to or when they are back in town. I’ve had numerous reunion dinners with various groups. I’ve been invited to several weddings. Once I met up with a former student in Tokyo when he was interning at CitiBank there and we had dinner. What can alumni do to help the Stuyvesant World Languages department or your classes? When I wanted to switch to new textbooks, it was hard. Luckily, I knew someone who was in a position to be able to donate a lot of money for the cause. After he retired, I had to find funds to make things happen for my students. The alumni association was very generous in funding many of my projects, ranging from a Japan Bowl trip to DC and buying materials. Foreign languages may not be the reason why our students come to Stuyvesant, and I know the emphasis is on the STEM subjects. But the humanities subjects are equally valuable and important. There are some students who choose Stuyvesant because we offer Japanese. So any support I can get and we can get is much appreciated. For instance, our AP Japanese textbooks are so old and are falling apart. They are not the NYS-approved book, so the school cannot purchase them. In fact, a lot of what the language teachers want to use are not on the approved NYS textbook list. It would be nice to have a new class set.